As I was musing on the upcoming Thanksgiving holiday, it occurred to me that it would be nice to pay tribute with a dedicated design to the people whom I love most dearly. Conveniently, there are a week’s worth of you…ok, I admit I am lumping all of my dearest friends into one group. 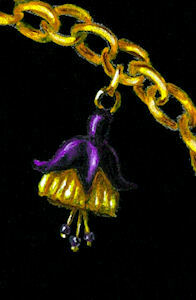 For my design, I settled on a charm bracelet. You each bring charm and blessings into my life for which I am so grateful. Much as the chain binds together these charms, I am linked to all of you by our shared love. When we are together the circle is complete, but even when apart, our ties can never be severed. Great fuchsia! We don’t see those reproduced much in jewelry. That’s true. My sister and I used to pull the flowers off of the plant (shh, don’t tell my mom), stick a little twig through the top part and pretend that they were little “ballerinas”. Hah! the “egg” comment lives on. That made me smile. Yes, D it does…although I’ve modified the version I say to my mother to something a little less suited for print;-) Yours is still priceless!